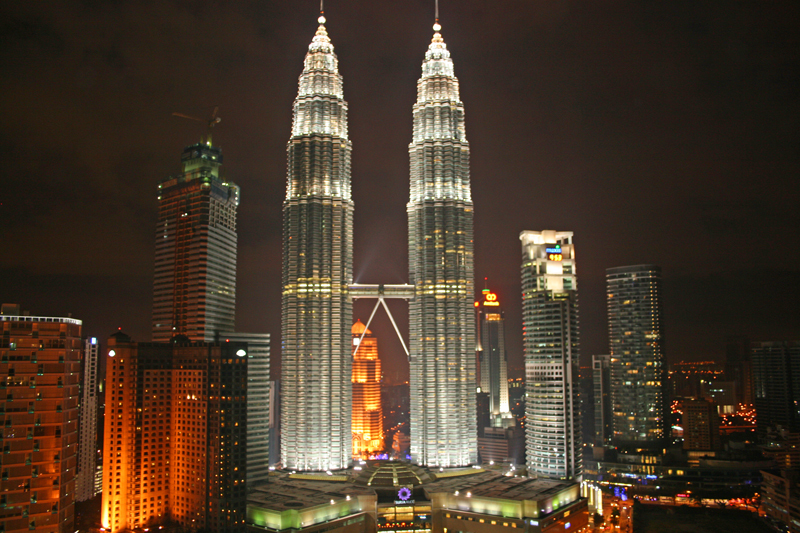 Kuala Lumpur, capital of Malaysia, is a modern city whose population is cosmopolitan, with an important number of people from Asian descent, of course, but also Indians, Westerners, etc. It is a gleaming 21st century city of high rises and highways with cutting edge, futuristic architecture that rubs shoulders with Moorish, Moghul, Malay and Victorian-style edifices. Tall spires atop the Petronas Towers in Kuala Lumpur, Malaysia make them among the world's tallest buildings, 10 meters higher than the Sears Tower in the USA. 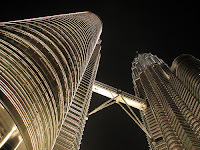 its jaw-droppingly ultramodern and ostentatious architecture – from the tallest twin buildings in the world, the Petronas Twin Towers to the second-tallest freestanding tower in the world, the Menara Kuala Lumpur. Traditional Islamic design inspired the floor plans for two Petronas towers in Kuala Lumur, Malaysia. Each floor of the 88-story towers is shaped like an 8-pointed star. The two towers have been called cosmic pillars that spiral heavenward. At the 42nd floor, a flexible bridge connects the two Petronas Towers. 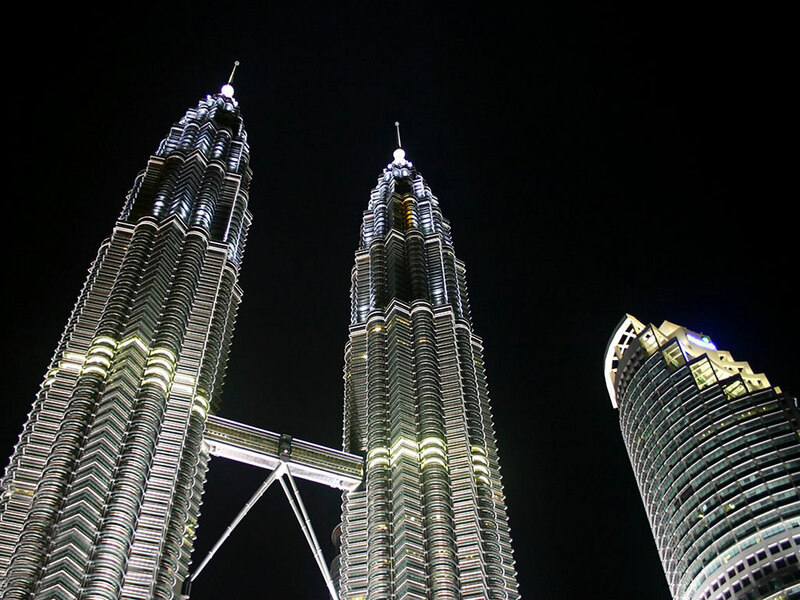 The 88-storey PETRONAS Twin Towers are now celebrated as the world’s tallest twin structures. Inspired by Islamic architecture, this gleaming mega-structure – standing 452 metres tall – retained its claim to fame until 2004 when Taipei's 101 was built measuring 508 metres – and with 101 floors. There is a tour of the Sky Bridge available at Petronas Malaysia where you can enjoy a panoramic city view below. The tour is a short 10 minutes and leads up to the bridge. The best time to go is early in the morning to beat the long lines that can develop. Tickets are handed out on a first-come-first-served basis and you can choose the tour time when you get tickets. The Sky Bridge is open from 9:00am to 5:00pm from Tuesday through Sunday and is free. 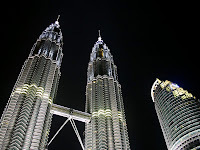 The Malaysia Petronas Tower is sprawling over 50-acres, the tropical gardens and lush foliage offer a haven of serenity and a respite from the dynamic and ever-busy inner city. The Petronas Towers are joined only at the 41st and the 42nd floor where the Sky Bridge is. Walking along the Sky Bridge is one of the main events when on a Malaysia tour of this captivating development. The bridge spans an astonishing 192 feet.